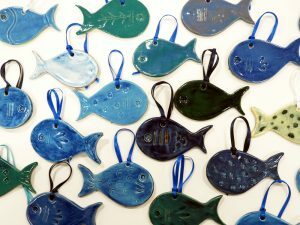 We run a pottery evening class at Banwell Pottery every Wednesday, for anyone to come along and have a go at pottery. This is a flexible course for beginners or experienced potters, offering slab work, coil work, hand building, modelling, sculpture, relief work, and tile making. Throwing is also available (access may be limited as we only have one wheel). The class is from 6pm to 8pm on Wednesdays and drop-in sessions cost £13 per session. The cost of materials is included. If you want to attend a course or session, or if you have any questions, please email the Pottery, or call us on 01934 756 481.